Help people understand that history and civic discourse should not be boxed into dichotomies, ready-made for divisive debates. This display adds to our understanding on how race has impacted the lives or real people. It helps us understand why we have been "forbidden" from driving through certain neighborhoods. Yes, race relations have improved. And yes, housing discrimination is illegal. But the effects remain. "How can we make our communities best for all, the best they can be" should be our starting point. Consider all the answers, grow your understanding w/ each conversation. 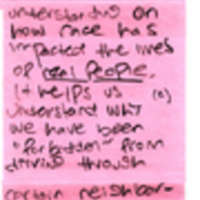 “Sticky Note 65,” Redlining Virginia, accessed April 21, 2019, http://redliningvirginia.org/items/show/85.